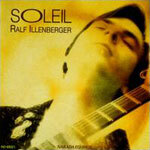 German-born guitarist Ralf Illenberger's latest release is a warm collection of tropical-tinged smooth jazz. Musically of the same stripe as fellow guitarists George Benson and Earl Klugh, Illenberger's playing is more classically influenced. His solos are more linear, with lots of arpeggios and short runs, rather than the chord changes of American jazz. But the warm tones of his acoustic lend themselves nicely to his style.